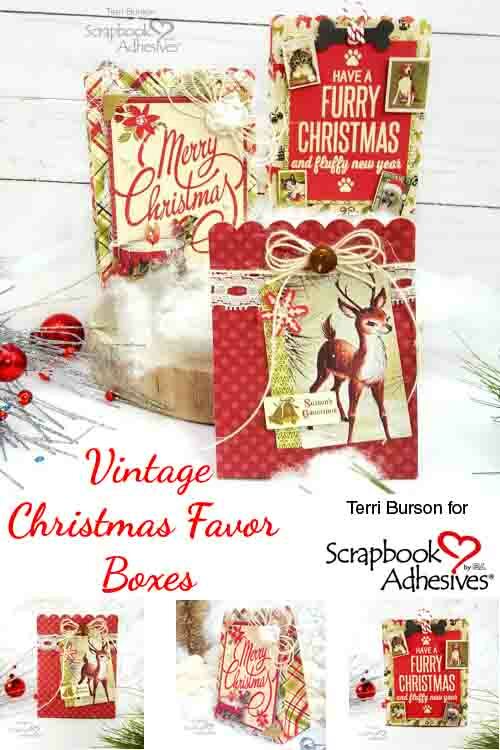 The holiday season is here and I have a trio of Vintage Christmas Favor Boxes to share with you today. 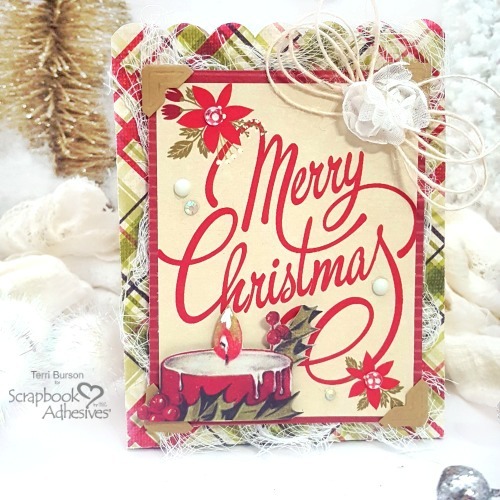 Hello crafters, Terri here. Grab a hot cup of cocoa and join me for a few minutes, as I share creative tips to make these adorable boxes! These are perfect for gift giving to co-workers, friends, or at holiday parties. 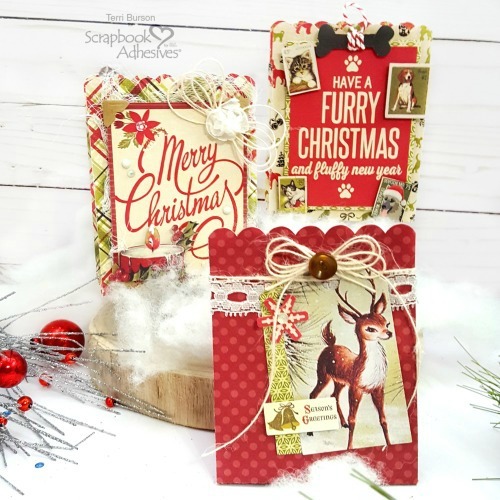 When choosing a theme for your favor boxes, the paper collection is key! This is why I’m creating with the Authentique Nostalgia paper collection today. 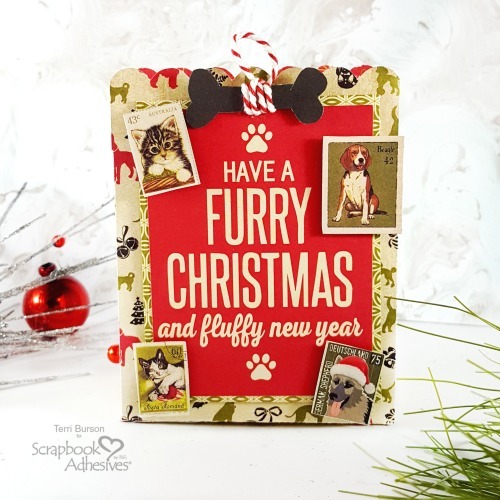 It’s filled with vintage and nostalgic images, as well as items to appease pet lovers. Choosing your vintage style embellishments are important too. They complement and complete your theme. I suggest you select timeless elements such as lace, ribbon, buttons, string and cheesecloth. Cheesecloth is used for more than just making cheese. It’s a staple in many craft rooms and it’s origins can be traced to Bangladesh. History says Marco Polo found this in India and brought it back to European countries. Cheesecloth later made it’s way to the United States, courtesy of European immigrants. You didn’t know you were getting a history lesson today, did you? 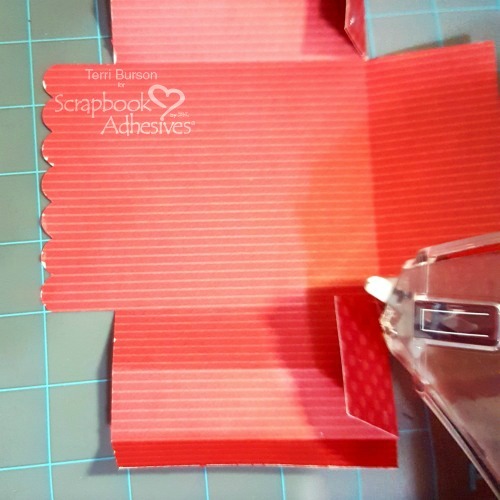 Scrapbook Adhesives by 3L® has many adhesives that get the job done. I rely on my E-Z Runner® Grand Refillable Dispenser and E-Z Runner® Grand Ultra Strong Refill. It’s quick, dependable and ready to go with a quick swipe. For my fussy cut images I use the 3D Foam Circles Black Mix. They’re great for popping up your elements and because they’re dark in color, they’re not as noticeable from a side view. 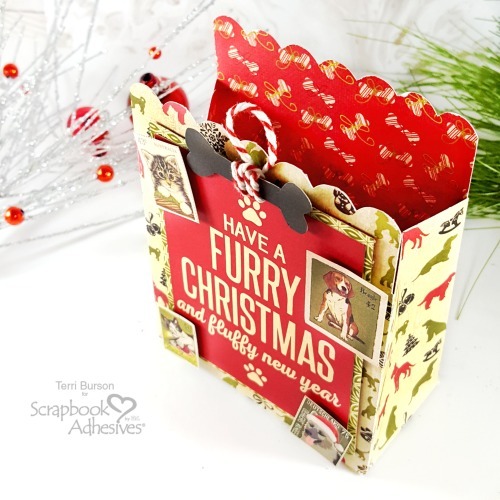 I love the versatility of these die cut boxes! You can find out more about the file that I used on my blog, the link is below. 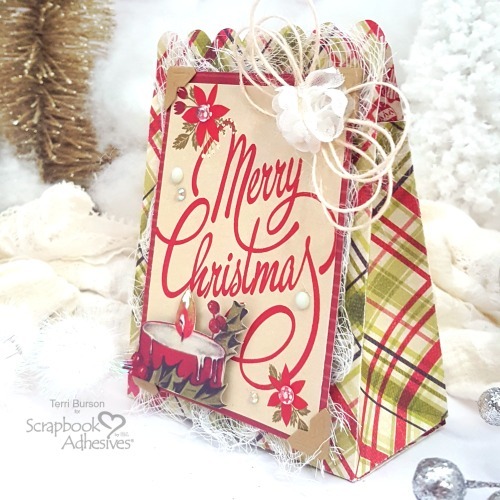 For the Merry Christmas box, I created a panel and applied Creative Photo Corners Kraft. The cheesecloth is adhered to the back with the E-Z Runner® Grand Refillable Dispenser using the E-Z Runner® Grand Ultra Strong Refill. As you can see from this side angle below, I sealed this box closed with the same adhesive. I love using the Crafty Foam Tape White to secure my panels. I can cut longer strips to fit the panel size. It brings dimension, balance and doubles as a strong base when adding more embellishments. Lastly, I used my Adhesive Dots Medium to secure my string and floral ribbon embellishment, and my Adhesive Dots Micro to adhere my tiny sequins and gems. 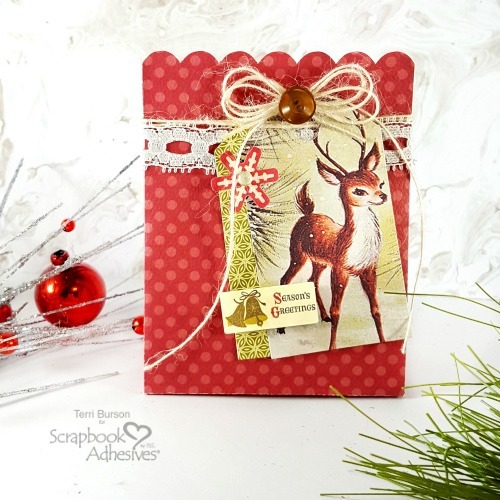 There are so many creative ways to use your adhesives and Scrapbook Adhesives by 3L® offers so many choices. 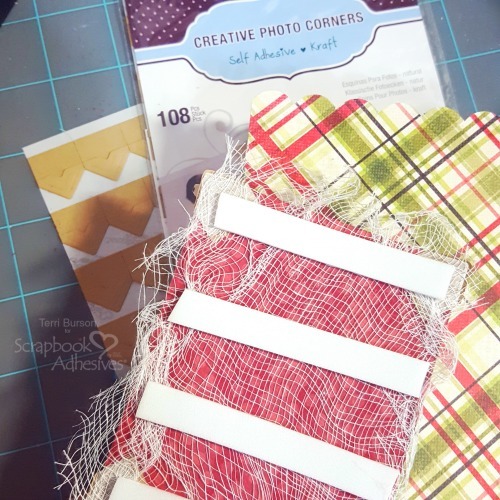 Trying new-to-you adhesives can open up a whole new world and really get your creative juices flowing! If you’d like to know more about the design file for this box, visit my blog at Waving My Wand, where you’ll find product links as well. Thanks so much for popping in! This entry was posted in 3D Foam Circles, Adhesive Dots & Lines, Adhesives, Crafts & Tutorials, Crafty Foam Tape, E-Z Runner® Grand, Embellishments, Gifts, Intermediate, Party Favors, Permanent Adhesive, Seasonal Craft Ideas, Skill Level, Winter and tagged 3D Foam Circles Black Mix, Adhesive Dots Medium, Adhesive Dots Micro, Authentique Paper, Buttons, Buttons Galore and More, Cheesecloth, Christmas, Crafty Foam Tape White, Creative Photo Corners Kraft, Cricut Explore, E-Z Runner Grand Dispenser, E-Z Runner Grand Ultra Strong Refill, Gift Bag, Gift Box, Gift Card Holder, Holiday, May Arts Ribbon, Party Favor, Terri Burson, We R Memory Keepers. Bookmark the permalink.